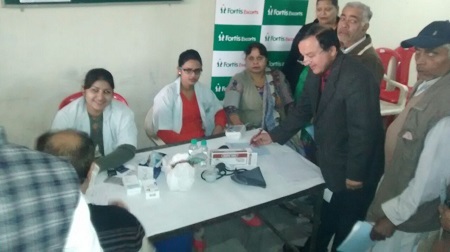 As a part of it community connect initiatives, Fortis Escorts Hospital, Amritsar in association with NishkamSewaSamiti organized health screening camp. Primarily focused on heart and joints, over 135 people took part in this camp and got advise from the specialists. Dr. Rajeev Mehra (Senior Consultant Internal Medicine), Dr. Mohit Arora (Consultant Orthopaedic Surgeon), Dr. Dinesh Kumar and Dr. Balraj (Physiotherapist) championed this screening camp.